We can supply, commission, service and repair most makes of generator and are the only company who offer makers warranties on every piece of equipment we supply. We can assist you to calculate the correct size of generator to ensure you purchase the generator that will suit your needs. 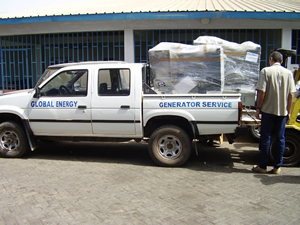 We will help you every step of the way from ordering to clearing the equipment through The Gambia Customs. Global Energy pride themselves on getting the job done to their customers total satisfaction. We can supply generators, depending on your budget and requirements. All new generators come with the manufacturer’s warranty subject to the generator being serviced and maintained by Global Energy. If you are purchasing a generator it pays to consider where it will be kept. Too often we visit generators that are in poor quality accommodation that has oil saturated floors, poor ventilation and lighting and poor access. As part of their commitment to quality service Global Energy would be pleased to advice on the design of your generator house (or modifying your old one if you are fitting a new generator). By fitting out your generator room you will ensure the best possible running conditions for your generator.